This thought experiment is from XKCD‘s new “What If” blog, which considers the consequences of various unlikely (read: impossible) scenarios. The ideas of aerodynamics don’t apply here. Normally, air would flow around anything moving through it. But the air molecules in front of this ball don’t have time to be jostled out of the way. The ball smacks into them hard that the atoms in the air molecules actually fuse with the atoms in the ball’s surface. Each collision releases a burst of gamma rays and scattered particles. After about 70 nanoseconds the ball arrives at home plate. 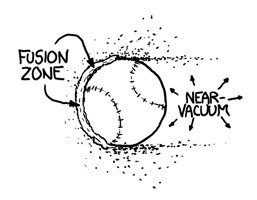 The batter hasn’t even seen the pitcher let go of the ball, since the light carrying that information arrives at about the same time the ball does. 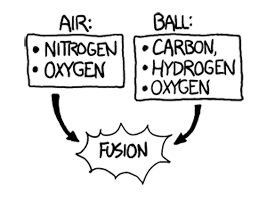 Collisions with the air have eaten the ball away almost completely, and it is now a bullet-shaped cloud of expanding plasma (mainly carbon, oxygen, hydrogen, and nitrogen) ramming into the air and triggering more fusion as it goes. The shell of x-rays hits the batter first, and a handful of nanoseconds later the debris cloud hits. A careful reading of official Major League Baseball Rule 6.08(b) suggests that in this situation, the batter would be considered “hit by pitch”, and would be eligible to advance to first base.